This brief describes a new instrument for measuring the impact of foresight. The foresight impact measurement instru-ment consists of 54 measures covering a wide range of foresight activities and potential policy and other impacts. 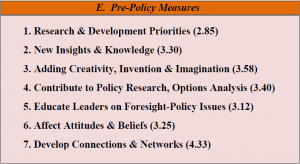 This instrument, developed primarily by Ron Johnston and the author, is the result of several sessions with leaders of many of the most active national foresight programmes and includes a variety of types of measurement categories – notably those that align with the policy cycle in terms of positioning foresight for future impacts on policies as they emerge or are developed. It also has been pilot-tested on two Canadian foresight programs – in both cases achieving strong participation rates, high frequency of written comments and positive assessments of most of the measures and very strong endorsements of several key measures. One of the cases, a national foresight project on animal health and food security is described in this brief. Essentially the instrument provides a baseline for interim evaluation – while the experience is still vibrant – and in so doing it can (1) provide a unique mix of qualitative and quantitative feedback for stakeholders, participants and sponsors; (2) be immediately applied if required to making the case for continuity, future foresight funding or new projects; (3) form a credible baseline against which more formal evaluation can be structured later; and (4) help create a key international benchmark data base entry and case example of public sector foresight impact measurements – and thus position the EFP well for the future. A key recurring challenge for foresight initiatives – projects, programmes and pilots – has been how to actually demonstrate the value of foresight investments for government sponsors and stakeholders – who are mindful of accountability, are asked to justify the value of foresight investments for government mandates and are requested to provide cost-efficiency and cost-effectiveness analysis so that foresight can be compared with other prospective applications of limited government funds. The methodology elaborated below is a response to this challenge, prepared by Professor Jack E. Smith with input from senior international foresight leaders from the US, Europe (UK, FR, NL, FN) Australia and Asia ( TH, CH, KR, SP). The methodology draws upon discussion papers presented by the author and Professors Jon Calof and Ron Johnston at five international meetings. 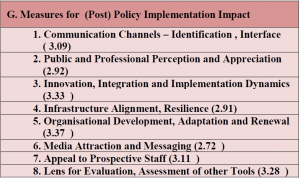 The challenge was to assess how to effectively measure impacts of foresight for government sponsors, operating in the short to medium term of 1-3 years when ideally these foresight impacts occur over a (mid to long term) five- to fifteen-year time horizon. In September 2011, the Fore-Can Project on Animal Health and Food Security completed a three year foresight-based assessment of major challenges and opportunities associated with the future management of animal health and food security systems in Canada. The project was well received, involved a wide range of stakeholders and effectively engaged key policy advisors and industry leaders. As with many foresight projects, questions of immediate and enduring impact were raised as the end of the project drew closer. Fortunately this timing has coincided with the development of a new series of long and short format impact measurement instruments as part of an international forum of foresight best practices (more below on this). Impact is a relatively imprecise and general term, which inspires almost as many distinct answers as there are participants – so having a new and fairly comprehensive instrument that can add precision and shape stakeholder thinking while they are still involved is both innovative and appropriate in addressing the diversity of interests. Impact happens at all stages of a project, i.e., during, immediately after and beyond completion, especially if there is a follow-up of projects – often until much later: so a time-flexible and adjustable instrument- linked to current and recent activities and also designed to accommodate later impacts is needed. The approach adopted uses a single instrument – as a long form where commentary plus scoring is solicited and as a short form where numbers of respondents will be larger; the narrative and the quantitative aspects are complementary. It has been designed to apply upon completion when memories are fresh and the knowledge still current; it can also be applied at any point in the future or re-applied as a comparative measure of time dependent impacts. In this way it can be applied today as a current measure of impact and simultaneously as a measure of positioning for future prospective impacts – as assessed by those most involved. This is why it is described as a preliminary baseline impact measurement tool that captures expectations as well as examples. Impact analysis is not the same as an evaluation but may provide needed input especially if baseline data has been collected during or just after completion since most evaluations occur much later. TFCI described the development process and demonstrated the two forms of the impact measurement instrument to the CFIA-led Fore-Can team. The project leader first sent the long form to 54 potential participants – of whom four declined to participate and four responded with many comments plus scoring. The short form was then sent to all, and ten more responses were received – mostly just with scoring of the 50+ variables; based upon the short notice and lack of solicitation before emails were sent, it is positive that 14 responses in total were received out of 50 potential ones. With more advance preparation, this rate of 28% could easily be doubled. TFCI then managed a dual analysis – combining the quantitative and the qualitative responses. The second set of impact measures, lens or grouping, consists of several general benefits, as perceived main-ly by those directly involved. As the impact data base and diversity of cases grows, differing patterns of pro-tagonist and stakeholder appreciation may emerge. A fourth set of lenses consists of seeing foresight main-ly as a macro or meta process, focused on foresight as essentially a learning process and that each foresight project educates someone, and usually all participants. Here the evaluation team collected testimonials, anec-dotes, personal stories etc. In the category “training & skills development” the evaluators acknowledged that foresight is often motivated by sponsors wanting to strengthen readiness, resilience and preparedness skills. These categories also give credit to the notion that fore-sight is a key tool for risk assessment and the man-agement of uncertainty. And finally, foresight is closely aligned with design and planning. Accordingly, the participants of the evaluation had the opportunity to give account of the changes induced by the foresight exercise such if their organisa-tion achieved new strengths, there was any evidence of foresight in adopted priorities or of new directions with foresight-derived origins. 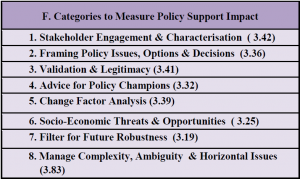 Further, in the impact design, three groups of measures were developed – related to successive stages of the policy cycle: pre-policy; policy implementation and post policy. Here the participants had to give a score (# score represents average out of 5 including all scores other than no response). Overall, these preliminary impact results indicate that the project had both a significant impact on participants from a present time vantage point and a well-positioned potential for future impact as expressed by the clear and consistent trend in the results toward impact endorsement in most of the variables examined. The conclusion to be drawn is not only that the project was quite successful in operational terms, but also that its full impact may only be known some years hence, given the strong prospects for future impact that were cited by most respondents. 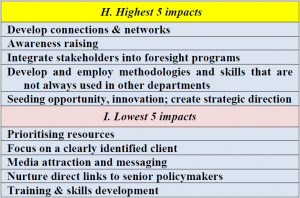 The lists of the top and bottom five impact elements provide a snapshot both of domains where there is strength or weakness but also reflect a high degree of alignment amongst the respondents. 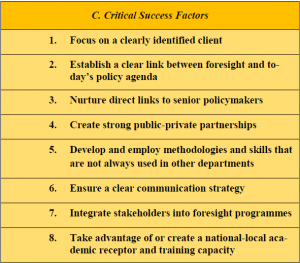 Also of note is that 2/5 of the highest and lowest impacts are from the critical success factors elements (questions # 6-13), and this suggests that the CSF list is a key differentiator of impact – as was intended by Calof and Smith when they undertook their study in 2007. The findings and the comments together present a consistent picture of a project that was both successful in achieving its intended near-term objectives and is well positioned for future impact and development opportunities. The ratings questions worked well to elicit stakeholder differentiation, which is normally regarded as indicative of a good engagement process, and many of the excellent comments reinforce this. Because of the clear and generally enthusiastic responses, prospects for continued support from the participants for follow-up activities appear positive. The combination of a long form and short form for impact assessment was viable, but both formats could be improved. The long format should be tailored to interviews, with some additional guidance provided. While it worked very well to elicit substantive commentary, it clearly was too daunting in terms of the time commitment required for most, particularly in that the impact analysis was an unanticipated additional time commitment for all stakeholders. Given the generally responsive attitudes, it is reasonable to assume that with more lead time, improved instruments, structured impact discussions built into the last meeting and a clear link to next stage development ideas, a response rate of over 60% can be anticipated – double what was received with almost no advance notice and no context preparation. The short format worked very well but likely missed a relatively easy opportunity to obtain short commentary on each of the eight sections of enquiry – thus enabling participants to elaborate the basis for their scores. The next version of the impact instruments will embody these improvements. Overall, the post project preliminary impact baseline measurement has been very productive: baseline data and a set of premises for future development and evaluation/assessment have been established, and much of the impact experience has been captured in comments and scores that validate the benefits of the project – notably while still vivid and current. The main implication is that policy authorities can now have access to a reliable interim foresight impact measurement instrument aligned with stages of the policy cycle – and as experience accumulates with its application, governments can begin to benchmark their foresight project impacts against other projects, nations, fields etc. Finally, the measures used for examining foresight impacts could be equally applied to most policy staging – so that at least the perception of potential impacts of policies could be measured during the development process rather than waiting for full implementation – when it is likely too late to adjust them. In order to successfully provide relevant groups with political support for implementing resource efficiency, one needs to know where to start best, thus, where the highest potentials are likely to be found. Addressing four key issues, MaRess identified potentials for increasing resource efficiency, developed target group-specific resource efficiency policies, gained new insights into the effects of policy instruments at the macro- and micro-economic level, provided scientific support for implementation activities, engaged in agenda setting and communicated findings to specific target groups. This paper presents the overall results of Work Package 1 (WP1) with regard to the potential analyses of the identified technologies, products and strategies. The results were gained from research conducted in the context of a graduate research programme, which was embedded in a network of experts who were involved in the analysis. The extraction and exploitation of resources, the associated emissions and the disposal of waste are polluting the environment. The increasing scarcity of resources and the high and fluctuating prices of raw materials can lead to major economic and social dislocations, combined with a growing risk of conflicts over raw materials. Competitive disadvantages arising from the inefficient use of resources endanger the development of businesses and jobs. A strategy for increasing resource efficiency can limit all these problems, which is why this subject is increasingly becoming a key issue in national and international politics. As yet, however, consistent strategies and approaches for a successful resource efficiency policy have been lacking. Against this background, the German Federal Environment Ministry and the Federal Environment Agency commissioned thirty-one project partners, under the direction of the Wuppertal Institute, to carry out the research project Material Efficiency and Resource Conservation (MaRess, project number 3707 93 300, duration 2007 to 2010). The project aimed at advancing knowledge with respect to central questions of resource conservation, especially the increase of resource efficiency with a focus on material efficiency. Therefore, the most interesting technologies, products and strategies for increasing resource efficiency were identified in a broad, multi-staged, expert-driven process. After that, their concrete saving potential was determined. 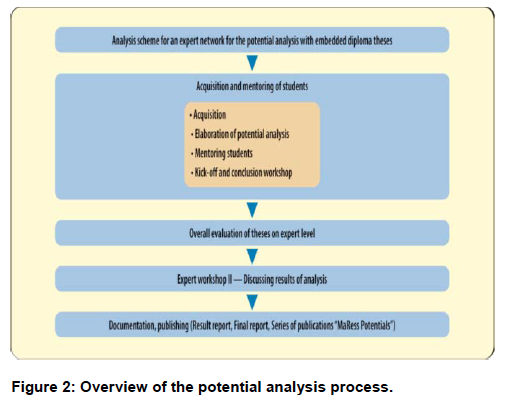 The potential analyses were carried out as part of a graduate research programme in the wider context of an expert network and expert-based analytical process. After their finalisation, the results of the single potential analyses were analysed in an intense discourse and cross-evaluation process. Finally, issue-specific as well as overarching recommendations for action were concluded. Step 1 “Broad collection”: Identifying topics via desk research and surveys. Step 3 “First evaluation”: Expert evaluation along seven criteria: resource input in terms of mass relevance, resource efficiency potential of the specific application, other environmental impacts, feasibility, economic relevance, communicability and transferability. Step 4 “Selection”: The final selection of the “Top 20 topics” was carried out in cooperation with the German Federal Environment Agency. Altogether, potential analyses were performed with reference to 20 relevant topics (“Top 20 topics“), which are expected to carry high resource efficiency potential. Methodologically, the resource efficiency potentials were quantified according to the concept “Material Input per Unit of Service (MIPS). Therefore, the potential analyses are based on resource use across the whole life cycle for up to five resource categories. They determine the concrete potential for increasing resource efficiency in each case. Besides the assessment along quantitative results, a qualitative evaluation was carried out to capture, among other things, possible rebound effects and constraints to the dissemination of the application. The qualitative evaluations are based on publications, statistics and expert opinions. After the finalisation of the potential analyses carried out by the students, the advisors pre-evaluated the theses. Furthermore, an internal evaluation workshop was held to assess the pre-evaluated potential analyses of the WP1 partners according to the seven criteria outlined in Step 3 and the guidelines for potential analysis in an overarching frame. The results of each individual thesis were discussed and specific, overarching recommendations for action were concluded. The topics worked on (“Top 20“) ought to be understood as the beginning of a systematic and encompassing analysis of resource efficiency potentials concerning our social and economic activities. Even though representing central and resource intensive sectors, the topics analysed naturally represent only a small selection from the totality of relevant topics and those that were identified and pre-assessed by the experts during the first expert workshop. Furthermore, some questions remain open and new questions were raised with regard to the topics addressed. Moreover, those topics presented in the expert workshop but not chosen for further analysis and those chosen at the workshop (“Top 50“) bear promising potential, which ought to be analysed in the future. There is also a need to study focus areas based on further case studies (e.g. central fields such as construction, living or food and nutrition). The analyses also demonstrate the need to make greater use of or develop suitable arrangements (such as networks) to involve industrial partners at an early stage. On the one hand, the existing network of the MaRess project needs to be strengthened; on the other hand, further forms and consortia need to be established (e.g. with a stronger focus on sector-specific topics). This aims at ensuring that the project stays in touch with matters of implementation and feasibility regarding the potentials analysed. Due to the broad range of topics and the possibilities for increasing resource efficiency in diverse sectors, the network of universities integrating the paradigm of resource efficiency in research and training ought to be expanded considerably. It would also be desirable to extend the circle of participating universities. So far, in university education, only few departments and specialist areas offer programmes (e.g., lectures, seminars, projects) in the field of resource efficiency. Therefore, there is much room for increasing the number of programmes offered while they also need to be better integrated into existing curricula. To foster the broad integration of resource efficiency into university training and research, activities for the establishment of a “Virtual Resource University” (from innovation to implementation research) need to be started. The results of the project will be documented in a comprehensive form in a final report and the central results are planned to be published in a book. Besides, the results of WP1 will be made use of in other work packages of the MaRess project and in the Network Resource Efficiency. Type: National foresight exercise to increase resource efficiency and conserve resources. The exercise presented includes scenarios of key Russian economic sectors and determines necessary technologies in accordance with such scenarios. As key sectors, the foresight team investigated the energy, iron and nonferrous-metals industry, agriculture, the chemical industry and pharmaceutics, the aircraft industry, commercial shipbuilding and the information sector. Over the last years, we have seen increasing activity of federal and regional authorities in innovation and industrial policy in Russia. This activity has led to a series of documents and commissions concerned with the long-term development of the Russian economy. Among them are industry strategies (in more than 15 sectors), a conception of long-term socio-economic development for the Russian Federation (RF), priority directions for the development of science and technologies, and the Commission for Modernization and Technological Development of Russia’s Economy under the RF’s President. The year 2006 marked the first “Concept for Long-Term Russian S&T Forecast till 2025” in the country’s modern history. This was developed and approved in cooperation with key ministries and science and business representatives. In 2006, practical steps toward implementing some of the foresight and forecast projects were launched (by 2012 we will have more than 50 key projects at different levels, including the national, regional and corporate level). The first serious attempt to organise a foresight project at the national level was conducted more than 30 years ago within the Complex Program of S&T Development for the USSR. It aimed at S&T forecasting for a period of 20 years and can be considered a project of the first foresight generation (according to the definition by Georghiou et al., 2008). For the next 10-15 years, there was an absence of foresight and forecast exercises. In recent years, a number of initiatives have been launched to overcome this deficiency (for more information, see Sokolov & Poznyak, 2011). Modern foresight projects in Russia today are very much in line with the current fifth generation of foresight exercises in developed countries, which includes a focus on social context and a strong policy-advisory orientation. Thus, we can say that Russian foresight development has taken a shortcut in these years and “leapfrogged” directly to what is currently considered the state of the art in foresight methodology. opportunities to cooperate with foreign countries. create pilot technology roadmaps for S&T fields and key sectors. To achieve our aim, the database was based on two pillars. The first included information and relevant data from foreign and Russian forecasts, foresights at the country, industry and corporate level, and key Russian documents on S&T and industry development. The second pillar comprised data from various industry experts, representatives of key industries and consulting companies. To construct various sector scenarios, we used elaborated qualitative models, which included sector analysis (characteristics of the technological base, organisation structure, role in exports, etc. 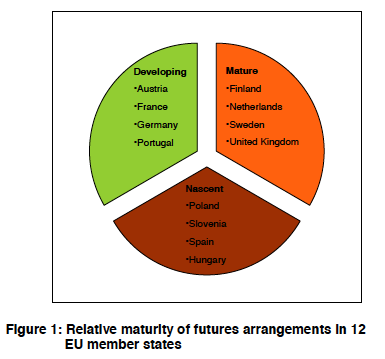 ), the identification of basic strategic alternatives for future sector development (e.g. technological and institutional), the construction of models of sector development, future visions, and the identification of priorities for S&T development in the sector in question for each vision. This resulted in four to eight prospective scenarios for each key sector. To discuss the preliminary visions and present a final set of scenarios, we held a series of round tables and conferences. We also formed a multi-level pool of experts: the core included so-called “system experts” – high level professionals who were able to provide a comprehensive evaluation of the vision for the sector in question (2-3 persons for each sector); the next level included sector analysts who could contribute in-depth knowledge of different aspects relevant to the particular scenario (e.g., on markets and technologies; 7-12 persons for each sector); the last level was public relations experts and experts familiar with governmental and administrative processes and included representatives of industry journals, key federal and regional authorities (about 10-15 persons for each sector). We conducted focus groups, in-depth interviews and surveys to gain information from the experts participating in the project. The beneficiaries of the project results are business (large, small and medium enterprises, business associations, industry institutions), government (state institutes for innovation development, federal and regional authorities), science (the system of Russian academies, research institutes), universities (leading institutes and labs in the Russian higher education system), and experts in the fields under consideration. Some of the main sectoral results indicated that key sector development scenarios took institutional and technologic alternatives into account while identifying the main technologies necessary for implementing the scenarios. The results for the various sectors were highly diverse due to different sectoral structures and the number of sectors (ten). The table and illustration below briefly show some results for two sectors. 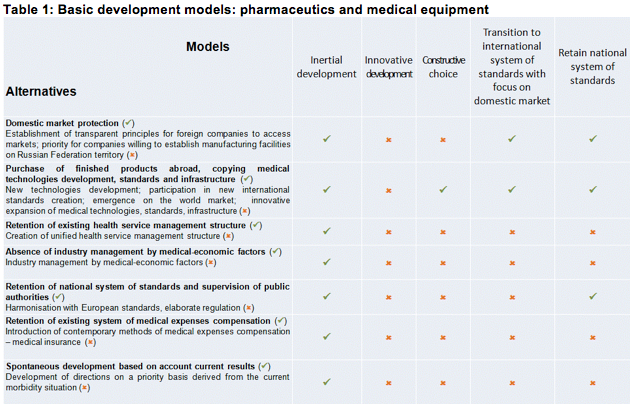 After the sector analysis, we elaborated seven alternative paths of development for the pharmaceutics and medical equipment sector based on a literature review along the criteria mode of regulation, position in value-added chain, degree of modernisation and management. Then we verified alternatives by consulting industry experts and developed the five most probable models. 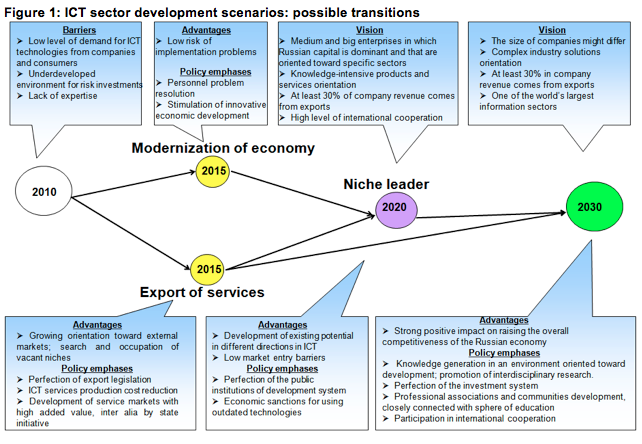 In case of the ICT sector, most experts agreed that a transition to the most preferable scenarios (“niche leader” or “technological leader”) cannot be accomplished directly. The only way to achieve them is to establish bridgeheads and use the competitive advantages gained to further advance toward the goal. Each scenario in Figure 1 contains a description of a future vision, possible barriers and risks, pros and cons, and recommendations for a shift in policy. The exercise led to the following three policy-oriented results: (1) alternative “preferable” visions for the development of key sectors that are not limited only to the simple dichotomy of “bad” or “good” as in major government S&T documents; (2) recommendations for integrating long-term S&T forecasting as a basic instrument for strategic policymaking; (3) formation of a multi-level expert pool to serve as a communication network for discussing and constructing Russian S&T policy. We believe that the lessons and experience obtained during this project are representative of the whole field of foresight and forecast initiatives in modern Russian history. One of the key success factors in foresight is participation of key stakeholders and experts involved in shaping the future. In the case of Russia (at least 3-4 years ago), a lack of foresight culture has resulted in an “a priori”, indiscriminately negative perception of foresight initiatives. This can be explained historically by the fact that there have been some serious gaps between science and business and, as a result, in the supply of and demand for innovation. Mutual complaints are voiced to that effect. Business shows little interest in projects oriented toward long-term outcomes, lacks receptivity to innovations and displays low levels of global competition. We can say that the key actors (government and business) responsible for shaping the future are not fully up to the task. They have lost the “habit” of planning for a time span of more than 2-3 years. One of the repercussions of the Soviet heritage is a lack of experts capable of acting as so-called “integrators”: experts able to devise strategies based on combining market pull with technological push. As a result, we have to first nurture a new generation of experts, typically to be recruited from representatives from the “technology” side, with the skills required to adopt a more comprehensive perspective of the sector as a whole. Apart from qualification, a lack of expert commitment poses another problem in that experts show low interest in collaborative work and are more intent on lobbying and pushing their own individual interests. Another serious drawback in foresight culture in Russia is an insufficient commitment to the processes required to formulate visions and scenarios on part of federal and regional authorities: they usually want to see “ready-to-use” results instead of participating in the process from the beginning. We believe that a serious obstacle to the development of foresight culture in Russia is the lack of actually working, sustainable, systematic communication platforms for discussing different foresight results. Only in the past 2-3 years have they grown in number, particularly platforms launched by national research universities, technology platforms, etc. (for further information see Simachev, 2011). Development of a common “cure” for deficiencies in foresight culture in Russia is complicated by the fact that Russian economic sectors are of a multi-structural nature, technologically and institutionally: some basic technologies are 100-150 years old and modernisation processes have not yet been completed in most industries. As a result, we observe a low level of innovation receptivity among Russian companies. Taking this into account, government policy should switch from “one-size-fits-all” instruments towards an innovation policy tailored to the specific situation in each sector or sub-sector. Georghiou, L., Cassingena Harper, J., Keenan, M.; Miles, I. & Pooper, R. (eds.) (2008): The Handbook of Technology Foresight: Concepts and Practice. Cheltenham: Edward Elgar Publishing. Sokolov A. & Poznyak A. (2011): Building Foresight Capacities for the Modernisation of the Russian Economy, EFP Brief No. 193, available for download at http://www.foresight-platform.eu. To establish a basis for informed decision-making, the BMVIT, the Austrian ministry for traffic, infrastructure and industry commissioned the creation of a technology roadmap for high performance metals. The project was carried out by the Austrian Society for Metallurgy and Materials, ASMET, and its two project partners, the University of Leoben and the Austrian Institute of Technology (AIT former ARCS Seibersdorf). More than 100 experts from 80 institutions, mainly from industry, participated in preparing the technology roadmap. The breadth of contributors facilitated looking at and analysing trends and technology development from many viewpoints. The outcome is a representative picture of relevant trends and technological developments to be expected in the future in high performance metals. Austria, with its companies and research foci, puts an emphasis on materials and materials technology. Among the materials, high performance metals play a crucial role for the Austrian economy and its future development. In terms of technology policy, the questions to be answered by the development scenarios and the measures to be taken represent a generic challenge for a national technology strategy. For Austrian businesses and research institutions, the very turbulent economic developments of the last years clearly show that focusing on technological and systematic development of these strengths can be seen as an essential contribution to economic survival. Operating in a field of tension between suppliers, competitors and customers, they must be well prepared for future technological scenarios. We can assume today that new technologies have to be developed by 2020. For the study of high performance metals, a variety of development challenges will appear in advance of these future technological developments. In order to seize these industrial developments as an opportunity for innovation, materials development has to start significantly earlier in time. All new high-performance metals require an at least ten-year period for development before an innovation finds its way into practical applications. Even for incremental improvements of high performance metals, we must expect a development period of three to five years. It is therefore very important that industry and technology policy together work out development strategies beforehand. To lay the groundwork for informed decision-making, a cross-technology roadmap for high performance metals processing has been developed, supported by BMVIT funding. The project was carried out by the Austrian Society for Metallurgy and Materials, ASMET and their project partners University of Leoben and ARCS Seibersdorf. More than 100 experts from 80 institutions were actively involved in creating the technology roadmap. The breadth of contributors made it possible to look at and analyse trends and technology developments from many different angles, giving a picture of the relevant developments in the future of high performance metals from the participants’ perspective. Methodically, the roadmapping process consisted of two major phases. A first phase was concerned with determining whether action is needed for creating a national inter-institutional technology roadmap for high performance metals in general. The key issues to be addressed in the roadmap were also defined. During this exploratory phase, more than 30 Austrian experts and managers were interviewed. It clearly showed that there is massive demand for an inter-institutional roadmap. In order to place the need for action identified in the exploratory phase in a comprehensive overall context, the second phase of the technology roadmap considered industry-oriented technological developments and developed actions and necessary measures for advancing high performance metals. The leading industries investigated ranged from power engineering to the mobility industry, with the sub-sectors aerospace, automotive and railway, and from the metallurgical sector to mechanical engineering. In addition to the sector specific perspective, technological trends in the crosscutting field of environment and resource management were addressed. In a detailed analysis beforehand, existing technology roadmaps in similar areas were examined, especially from English-speaking countries. The analysis determined what the lasting changes in the respective industry were and what had led to these changes. In a series of workshops, we identified the relevant developments and measures that have to be taken. The workshops were attended by representatives from industry and research in the field of high performance metals and representatives of companies downstream in the supply chains of a particular industry. A total of eight workshops were conducted, involving between 10 and 20 participants each. Each workshop was structured such that relevant trends were verified in the beginning and discussed in a first phase. Subsequently, the changes expected in the market by 2020 were identified. In order to highlight the relevant developments, the selected challenges were prioritized. In a next step, the developments expected in the field of high performance metals and their production and processing technologies were worked out. The workshops concluded by prioritizing these developments. The last part of each workshop was devoted to developing individual measures suited to meet the challenges. Written reports of the individual workshops were compiled to inform the participants about the results. Subsequently, the results of all the workshops were condensed into a single report. This condensed report was then sent to all participants in the roadmap process for further comments. At the same time, the report served to clarify whether or not further experts needed to be consulted to answer additional questions or further expert meetings were required to address identified knowledge gaps. All industries showed the same crossover scenarios. The problem of future energy availability is turning into a major driver of development. Global scenarios predicting social and economic growth outside of Europe dominate the critical paths of development for the business location Austria in the field of high performance metals. An essential result of the roadmap is that we can expect growth only in sectors where aggressive research efforts are combined and focused on technology for innovative processes and products. However, this will only happen in favourable niches or at least in areas where it is possible to defend the current position in the field of high performance metals. Basically, the proposed measures recommended in the technology roadmap can only succeed if Austria remains committed to being a production site for high performance metals. Regardless of the sector considered, the technology roadmap shows that a positive image for high performance metals and related production technologies must be built in order to attract appropriate human resources, to train junior staff and to increase the pool of knowledge workers significantly. Progress in the whole area of mobility is linked most intensively and significantly with innovations in the field of high performance metals. The technology roadmap focused on the automotive industry, aviation and railways. All three sectors are generally expected to grow by 2020 although the current economic crisis will reduce the growth rate. The pressure to innovate by creating new products and processes is growing, driven by international competition based on established research resources. Dominant development issues in the field of mobility are lightweight, energy conservation and new drive concepts. The need for lightweight construction leads towards a unique competition of materials by substitution in the field of high performance metals. Considering the high performance metals only, those will be favoured that have low densities or perform with extremely high strength and stiffness properties. Life cycle assessment and the possibilities of recycling high performance metals after the use phase will gain much more importance than today in the selection of materials. High performance metals, required to achieve new economic goals and technological solutions, are still in the basic research stage. Within the period considered in the technology roadmap, high performance metals have to be developed and optimised across all process steps in the value chains. Areas of development mentioned are metallurgy, metal forming, casting techniques, joining and surface technology. Solutions for technological problems will be increasingly coupled with a focus on cost-efficient production technologies. Today’s technologies are often limited by an increasing lack of technological development potential. The development of new breakthrough technologies would be required to implement innovations in the field of high performance metals. The measures proposed aim at reaching a stronger interdisciplinary integration of research and technical areas and pursuing important systemic research issues in supercritical and visible international research units based on a sustainable and topic-oriented research funding landscape. The energy industry is characterized by strong growth in demand combined with inadequate availability and uneven global distribution of energy resources. Development scenarios show both an investment boom in the area of high performance power plants as well in the area of more local, autonomous power supply units. Performance and efficiency gains in thermal power plants are only possible with an increase in operating temperatures, pressures and in the dimensions of the major components and assemblies. Today’s materials solutions based on high performance metals do encounter limits in terms of fatigue, creep and corrosion resistance and can only be extended further by intensive materials science advancements. Innovation challenges are the development of customized materials solutions combined with a reliable and reproducible production technology. The increasing size of critical parts such as valves, turbine rotors or casings set technological limits to currently used technologies, such as casting or forming. In the field of renewable energies, which will likely allow an autonomous energy supply, Austria’s development potential and thus the need for developing high performance metals was not rated very highly by the participating experts and companies. An issue that will gain even more importance in the future is energy transport and energy storage. The participants assessed them to be very user- and market-oriented already now. Measures to promote high performance metals in the field of energy technology require a concentrated effort at developing knowledge about already known materials, including the development and optimisation of manufacturing technologies, such as casting, forming and joining technologies, and the structural design and testing of large components. This development must be aligned internationally and performed within major international networks to develop efficient and economically viable solutions. This also requires aligning research funding and grants accordingly. The subject of energy technology and high performance metals must in general be given more room and attention and must receive more sustainable funding in the Austrian research promotion and funding landscape because of its national strategic importance. The trends of development in metallurgical engineering again reflect the developmental needs and the developmental orientations of other industries. Thus, metallurgical mechanical engineering is faced with increasingly larger magnitudes of processed materials, growing demands on strength and difficulties in processing high performance metals. Due to the required heavy investment in development units, it is not expected that a breakthrough technology can be realized within the time frame of the roadmap. Improvements will rather have an incremental character; development potentials for high performance metals are identified where an increase in process efficiency and effectiveness can be realised or the lifetime of production facilities can be increased at higher levels of utilisation. Measures recommended are again intensified networking of metallurgy research with the metallurgical and downstream industries, as well as the increased use of modelling and simulation based on a sophisticated database. This will lead to better process control and knowledge-based further development of technological standards. Environment and resource protection in the production of high performance metals is clearly a very important crosscutting issue, which no group of high performance metals can escape. The rising global demand for raw material resources raises questions concerning the availability and accessibility of raw materials by 2020. As demonstrated in the days before the economic crisis, volatile commodity prices are a serious problem, which cannot be solved by technological measures alone. From a technological perspective, the use of recycled materials in the production of high performance metals constitutes a major factor in relaxing this problem. The use of secondary metals to produce high performance steels has been successfully practiced for a long time already. However, in the field of high performance non-ferrous metals, there is still a lot of potential but also a correspondingly great need for research both in materials as well as in technology development. The revised report was submitted to the BMVIT for authorization. After the BMVIT released the results of the technology roadmap, they were presented to the general public and especially to the key players in the field of high performance metals as well as to all members of the ASMET association. The stakeholders showed strong interest in the results of the process and appreciated the formulation of a common strategy document, which can be considered an informal effect of the project in the sector. The policy recommendations developed in the roadmapping process have been partially implemented in the context of targeted measures and individual projects. Furthermore, in 2011, a project consortium, consisting of ASMET, the University of Leoben and the Austrian Institute of Technology, proposed a follow-up foresight to succeed the roadmapping process. The aim of the suggested foresight is to highlight the societal context of future developments in the materials sector on a global scale to go beyond a narrowly technological perspective in the roadmapping process. In addition, the submitted foresight proposal aims at identifying relevant framework conditions in order to facilitate political decision-making, not only in the field of high performance metals but for the Austrian materials sector as a whole. 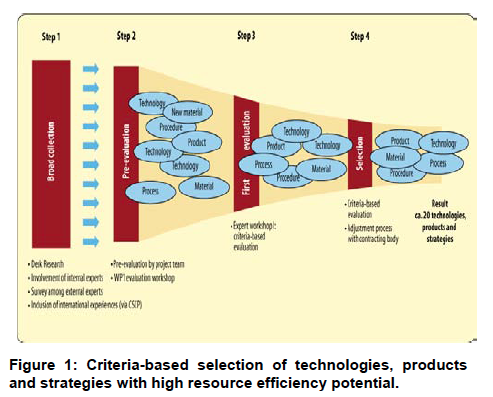 Jäger, H. (2009): Technology Roadmap High Performance Metals 2020. Final report, 1st issue. Leoben: ASMET– The Austrian Society for Metallurgy and Materials. The purpose of the exercise is to offer business people, policy makers and politicians lines of approach to determine strategy, policymaking as well as initiatives for change by presenting future visions and an accompanying agenda for the future with respect to transportation of people and goods in the Netherlands of 2040. Reinventing mobility is more than just “reinventing the car”. It involves the development of a new mobility paradigm and a full-scale alteration of the transport system. Mobility denotes the transportation of objects over a certain distance, in a certain environment, the movement of people, their patterns of life, work and recreation. The increasing speed at which time and place of social and commercial life takes place creates demand for new kinds, modes and scales of mobility. What will mobility look like 30 years from now? Mechatronics, nano-electronics, interconnectivity and intelligent software will increasingly play a role in people’s daily lives. These technologies affect all societal domains and will have a great impact across all sectors of society. These developments have an enormous effect on the attitude and behaviour of human beings; interaction between technology and its users becomes an ever more crucial factor in finding solutions for problems in any domain, including mobility. Hence, implementing new technological solutions requires an integral approach from different disciplines. The main question of this foresight study is: why and how will the citizens of the Netherlands transport themselves and their goods 30 years from now super intelligently? In order to answer this question, a set of four possible future visions will be defined (not necessarily conceivably probable or preferable). Each of the future visions will be accompanied by an agenda for the future. It will outline strategic questions regarding a preferred transition model. A complete system change seems inevitable and technologically attainable options will be given as well as suggestions for ‘no regret’ activities, input for future feasibility studies, and questions for further scientific research and experiments. The target audience of this foresight study are (Dutch) business people, policy makers and politicians. In this study, transport is considered to be a function within a society. Transport is a derived activity required to fulfil other (personal) needs like work, education, doing groceries etc. In our opinion, an integral transport system includes both the transport of people and goods. Transport can be physical but also virtual or a combination of both. The term ‘super intelligent’ is to be interpreted not solely from a technological perspective, but also from the perspective of interaction between a machine or intelligent network, on the one side, and a human being, on the other. The challenge is to think beyond current possibilities and to consider, among others, transport systems that can regulate, manage and perform autonomously. Dutch society, with its own set of demographics, economics, spatial planning and government, is the focus area of this study. Mobility will be addressed within and between cities as well as in rural areas, including interconnectivity between these places. Technology as well as human behaviour and society are important aspects in this study. The Netherlands Study Centre for Technology Trends (STT) organises this study, which is managed by a Project Manager with support of the STT office, under supervision of a Steering Committee. The Steering Committee monitors the progress as well as the cross-sector dependency, consistency, structure and overall logic of the project. STT foresights are based on a participatory approach with members from many different disciplines. A broad Market Vision Group with Dutch CEOs provides its vision on challenges, acceptance and risks in bilateral talks. A Technology Vision Group analyses future technological innovations from a sector or functional domains and works towards an integrated view. A Behaviour Vision Group analyses changes in, for example, societal and behavioural attitudes and acceptance. The results of desk research, individual interviews and the outcomes of the interactive and creative meetings of the different vision groups have resulted in four scenarios. To stimulate ideas across domains, each of the scenarios will be deliberated on by a mix of members of the Technology and Behaviour Vision Groups and some external organisations. For each scenario, we will determine the transportation needs and translate them into possible transport systems. The final future visions will be validated in an expert meeting with the members of the different vision groups and external experts. The broad and participative setup of STT studies instigates commitment for follow-up actions already during the course of a study, not least because a cross-disciplinary and cross-company network is established. Industry: Arcadis, Cap Gemini, Cisco, ECT, Essent, IBM, INROADS, NXP, Schiphol, Segway, Siemens, Spijkstaal, TomTom. Knowledge institutes: Delft University of Technology, Eindhoven University of Technology, Next Generation Infrastructures, Rotterdam University (Hogeschool Rotterdam), Tilburg University, TNO, University of Groningen, University of Twente, VU University Amsterdam. NGOs: ANWB, Connekt, KIVI NIRIA, Agrologistics Platform (Platform Agrologistiek). Government agencies: Dutch Ministry of Economic Affairs, Agriculture and Innovation, Ministry of Infrastructure and the Environment, NL Agency. This study is still in progress. Therefore the findings mentioned below are provisional. As transport is considered a function within a society, future developments within the society are the starting point for exploring future transportation needs – notwithstanding the fact that we are aware that future technological developments will also have an impact. Urbanisation: the degree and manner of urbanisation affect the transport patterns of people and goods. Demographic developments: population growth, increase in number of elderly citizens, relative decrease in number of young people –different age cohorts spend their time differently and hence have different transportation patterns. Individualisation: what effect will the growing dominance of each person’s needs on (public) transport be? Informatisation: informatisation changes the nature of services and the distances goods have to travel. Globalisation: the distance to be covered has an impact on the transportation mode used. These trends and their possible counterparts are input for the framework in which the four scenarios will be developed. Following the trends above and considering other frameworks, such as that of CPB (2010) (see references), we have defined our own framework in which a human being and his/her needs to live, work and recreate are at the core. A person’s needs, focus and preferences are the underlying thought behind the proposed framework. The two trends of individualisation and globalisation (and their possible counterparts) are set against each other to define the four future scenarios. Other relevant trends (and possible trend breaks) are used to complete the description of the four scenarios. The degree of individualisation is believed to indicate a person’s preference for individual or collective transport of people. As for the transport of goods, it indicates the desire for more ‘tailor-made’ or more mass-produced goods and therefore the possibilities (and restrictions) in production, transportation and delivery of goods and services. The degree of globalisation (geographical orientation) determines the distance that people, goods and services have to travel. With these two dimensions, participants are invited to consider two important aspects of transport: the number of items to be transported and the distance to be covered. By differentiating those two aspects, we believe the four future visions will be sufficiently distinct. As stated before, this framework is not based on an existing model and therefore does not have a direct connection to other foresight studies or future scenario sets known to the participants. Therefore, the descriptions of the four future scenarios have to be clearly depicted and sufficiently insightful. Individuals seek after prosperity and luxury and work in casual relations for different clients. They deliver their contribution to global, virtual, shifting teams from their homes. They are not interested in the origin of products and services they consume as long as they are delivered right in time to their door and fully adjusted to their wishes. People live in cities. Tasks are highly divided; hence people are highly specialised in their profession. Services are the dominant work field. New technologies are maturing. Products and services are produced at the most suitable location. Government agencies worldwide have taken the lead for a healthy environment and manage the responsible use of natural resources. Companies make sure the economy runs smoothly. People have a regional network of acquaintances and social activities. Due to strict environmental policies, economic growth is no longer the predominant priority. Intensive reuse of natural resources and goods has restricted trade between regions. Society has shifted its focus from economic ownership to right of use. A region hosts most of the goods and facilities needed, so people see no reason to leave the area, not even for a holiday. A worldwide crisis has triggered a dramatic shift in society. It has brought about the development of highly self-sufficient small communities, which are organised according to the principle “cradle 2 cradle”. Thanks to technological developments, habitats offer sufficient means of subsistence, and large global production flows belong to the past. Sharing knowledge globally is key to accomplishing this. Autarkic communities take up a lot of space relatively. This has resulted in ruralisation and a redevelopment of urban areas. These scenario descriptions will be discussed by a mixed team of members from the Technological and Behavioural Vision Groups. They set the context for defining the transportation needs in each scenario and for possible (new and existing) modes of transportation to fulfil those needs. Future technological possibilities will be linked to (expected) societal issues as well as to solutions of problems. The consequences for society and its institutions, the profit sector, public sector and labour market will be analysed. Behavioural change is an ever-present aspect in all of these. These expected technological developments will be used to translate future transportation needs into proposed transportation systems in each of the four scenarios. Recurring and Remarkable Ideas: How Will a ‘Cocoon Life’ Affect Future Transport Options? During the different meetings, some ideas have recurred. Others stood out based on their ‘outside the box’ character. A selection of these ideas is listed below. These ideas will be used to inspire and further develop the four future visions. The key issues for policy-making, the solutions required to tackle challenges and benefit from opportunities, the priorities and focus for action as well as critical factors and key players in shaping the future will be determined during the final part of this study. The Netherlands Study Centre for Technology Trends (STT) was established in 1968 by the Royal Institute of Engineers (KIVI NIRIA). STT explores new trends and develops inspiring foresights on technology and society. For this purpose, STT provides a free space for enthusiastic stakeholders to meet and construct creative views on the future. STT aims to give publicity to its findings as a contribution to a more integrated picture of the future of society in the Netherlands and elsewhere. The results serve as starting points for new initiatives, such as national (applied) research programmes or public-private cooperation. STT addresses industry, government, science and all other interested parties. STT publications are highly valued in both the private and public sector.